Royce Freeman: RB1 Upside as a Rookie? 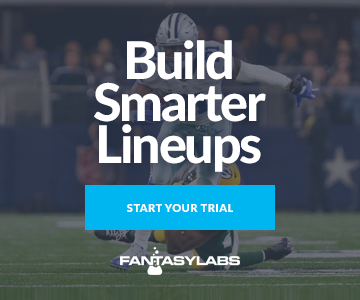 With the NFL Draft and free agency having come and gone, we’ll break down all sorts of fantasy-relevant questions entering the 2018 season. Here we’ll look at the hurdles the Denver Broncos’ rookie third-round pick will have to clear to win the starting running back job. The Denver Broncos selected Royce Freeman with the 71st overall pick in the 2018 NFL Draft with the hopes of finding a more effective replacement for C.J. Anderson, who handled 245 carries for Denver last season but was released prior to the draft. In the past two years alone, six backs have finished as fantasy RB1s in their rookie seasons. Is Freeman next? The only player who figures to take away from Freeman’s opportunity to be a featured back in Denver is Devontae Booker, who is currently listed as the team’s first-string running back. However, Booker’s career yards per carry average of 3.6 indicates that his best fit may be as a backup to a more efficient player. Coming from Oregon’s spread system, a pro-style offense could seem like a foreign concept to Freeman, but the Broncos hired Bill Musgrave midway through the season as their offensive coordinator, and Musgrave runs a west-coast style of offense which is similar to the spread. 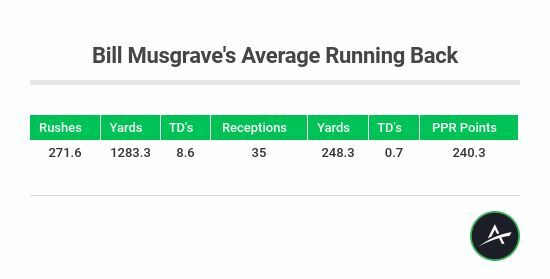 More importantly, Musgrave’s offense heavily utilizes a featured back in the running game. As you can see, Musgrave-led offenses typically feature a dominant fantasy back; the average of 240.3 PPR points would’ve ranked No. 8 in 2017. Denver’s passing game may be the biggest hurdle Freeman faces on his path to top-12 running back status. The Broncos ranked just No. 27 in points per game last season (18.1), which in large part stems from a similar ranking in yards per pass attempt (6.5; No. 26). This is a direct result of the three-headed monster at quarterback featuring Trevor Siemian, Paxton Lynch, and Brock Osweiler, all of whom contributed nothing more than below-average quarterbacking for the Broncos. Luckily for Freeman, 2018 free-agent acquisition Case Keenum was incredible for the Vikings in 2017 and should provide an immediate substantial upgrade at the position. Keenum posted a 67.6% completion percentage, 7.4 yards per attempt, and a 22:7 touchdown-interception ratio last season while Broncos quarterbacks collectively turned in marks of 58.5%, 6.5, and 19:22, respectively. Keenum’s 2017 numbers best Denver’s passers in every measure by a wide margin, and as you can see from the graphics above, this was true in DFS as well. His 50% Consistency Rating is far superior to Denver quarterbacks’ 31% mark, and he should be able to provide the offense with the weekly floor that it sorely lacked in 2017. While the Broncos don’t feature surrounding talent as prolific as the likes Adam Thielen and Stefon Diggs, the team still fields competent wide receivers in Demaryius Thomas and Emmanuel Sanders, both of whom are talented enough to allow Keenum to perform leagues ahead of the quarterbacks the team trotted out under center last year. This will increase the scoring potential of the offense and the fantasy potential of Freeman — lead backs have a correlation coefficient of .29 with their respective passers in fantasy points (which is relatively strong in this sphere), per our NFL Correlations Dashboard. The Broncos offensive line also struggled last season, with three of five starters placing outside Pro Football Focus’ top 40 at their respective positions. However, the unit could improve in 2018 with the addition of tackle Jared Veldheer, expected development of second-year left tackle Garett Bolles, and retention of standout center Matt Paradis. Freeman has the college resume of a dominant back and will play for an offensive coordinator who won’t be afraid to use him at an absurd rate. If the offensive line and quarterback play improve as they should, a top-12 running back finish is well within his range of outcomes.